Hundreds of people have attended the funeral of North football legend Bob Stokoe, who died earlier this month. 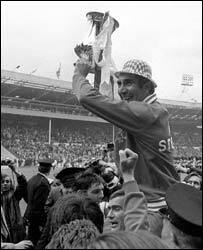 Stokoe, who led Sunderland to football glory in the 1970s and also managed Carlisle United and played for Newcastle United, died aged 73. Former team mates and members of the victorious 1973 FA cup-winning team attended the service in Newcastle. The Reverend Neil Cockling told mourners: "He will be remembered by all as a real gentleman." Mr Cockling, who conducted the service at Newcastle West Crematorium, added: "Such was Bob's standing that we can see Sunderland and Newcastle here together today to celebrate his life." Stokoe was in the Newcastle United team which beat Manchester City 3-1 at Wembley in 1955. But he will be best remembered for his celebrations after the FA Cup final victory when, wearing a raincoat and trademark trilby, he ran onto the pitch to congratulate goalkeeper Jim Montgomery after the team's victory over Leeds United. The majority of the 1973 cup-winning team were present at the funeral, including winger Billy Hughes. He said: "[Stokoe] gave us the best day of our lives so the natural thing to do is to come here and pay our respects for the man we loved. "We all knew he had been poorly but it still came as a shock when he died." Current Sunderland manager Mick McCarthy, said: "He meant everything to Sunderland. "He is remembered very fondly for his achievements and when you see all of the football people here you can see how much it means that he has gone. "That game was Sunderland's greatest ever achievement and it also summed up the romance of the FA Cup." Club chairman Bob Murray added: "The Stokoe team captured the heart of the nation and everyone, outside of Leeds, felt it was a victory for the underdogs." Stokoe died on in a Hartlepool nursing home on 1 February following a lengthy battle against a severe form of dementia. Born in Prudhoe, Northumberland, he made 288 appearances for Newcastle between 1947 and 1961. He began his managerial career at Bury, where he took over as player-manager in 1961. He then had spells at Charlton and Rochdale before beginning a long-standing love affair with Carlisle, which he managed three times in an 18-year period.